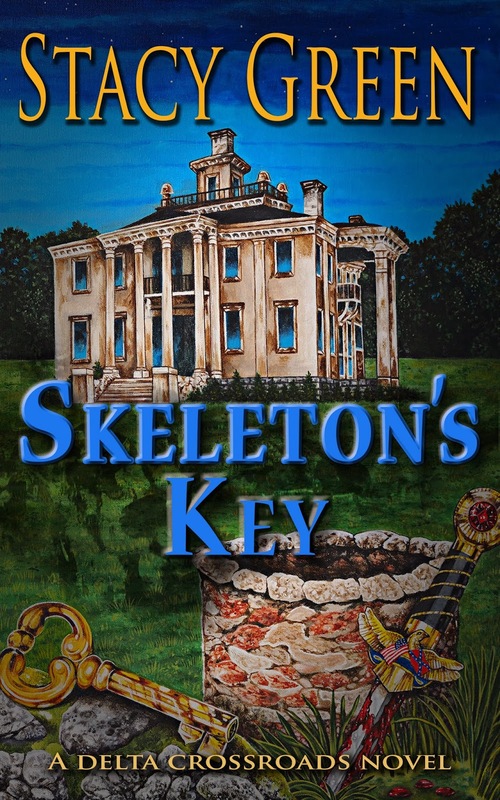 Welcome to the release of SKELETON’S KEY, the second book in the Delta Crossroads Series. Set in fictional Roselea, Mississippi, the book follows Cage Foster, a popular character from TIN GOD (Delta Crossroads #1), as he struggles to find himself after his sister’s death is resolved and he’s forced to admit he’ll never have the woman he loves. Don’t worry, SKELETON’S KEY is a true romantic suspense, and Cage will find love. That comes in the form of a Yankee newcomer who challenges his temper and steals his heart with her staunch belief that Cage is innocent of the double homicide he’s being investigated for. That’s right, Cage finds himself neck deep in trouble when two bodies are found buried in the cellar of Ironwood Plantation, the historical home he’s been working on. 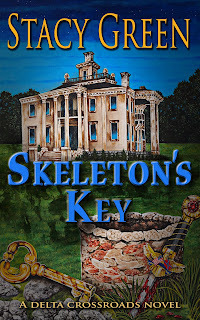 Cage is an Adam’s County Sheriff’s Deputy, and at the beginning of SKELETON’S KEY, his heart is about as run down as Ironwood Plantation, the historic home he’s been caring for. Ironwood is truly another character in the book, and Cage’s work in the house is a big part of his healing process. In a way, the house’s journey and eventual transformation represent Cage’s own journey. And all old houses have their secrets, right? A power outage leads to the discovery of an old skull in the basement, and Cage finds himself having to deal with the new owner of the house–a damned Yankee–much earlier than expected. Cage and Dani are at odds from the beginning, but drawn to one another’s strength and loyalty. As I wrote SKELETON’S KEY, I quickly fell in love with Cage, and making Dani worthy of his affection wasn’t an easy task. She needed to be able to challenge his stubbornness while appreciating it, and she needed to be secure enough to handle his friendship with Jaymee Ballard as well as their tangled history. Cage is a traditional Southern guy, and Dani is anything but a typical Yankee. Writing their scenes was so much fun, because the tension between them naturally sizzled. By the time Cage finds himself a murder suspect, Dani is frustrated by their complicated interactions but positive of his innocence. She stands up for Cage and puts herself in danger to help find the real killer, and through her devotion, Cage is able to realize what it’s like to truly love someone. An excerpt from SKELETON’S KEY (Delta Crossroads #2), available in print and all digital formats. To set the scene, Dani’s a restoration expert from Indiana and the new owner of Ironwood. Ever the southern gentleman, Cage takes her to dinner on her first night in town. "A lot of these houses are post-Civil War," Dani said as she pressed her face against the passenger side window. "But they are definitely pre-1900." The winding country road took them past a small cotton farm, the white bolls blowing proudly in the wind. "You know, there's more to Mississippi than the old homes.” Cage drove past Miller’s farm and waved to Slim, the potbellied owner who labored over a fence rail that refused to stay in place. Cage suspected the overgrown kudzu Slim battled would bring the fence down one of these days. Dani tore her gaze away from the window. "What's your favorite thing about Mississippi? And please don't say the heat." "No one in their right mind would say the heat." Cage thought for a minute. "I love everything about Mississippi, but if I had to choose, I'd say the dirt roads." "Sure. They take you places where you're the only soul around. Just you and the sound of the trees and the bird calls. Man can sit for hours just in his own head. That's peace." Cage had spent many hours rolling over the dirt roads, reflecting on life and what he’d lost and never won. His sister was gone, and the one woman he’d loved inaccessible. The dirt roads were a kind of silent therapy. Dani didn't respond, instead sitting quietly and once again staring out the window. Cage's eyes slid over her frame. She reminded him of a wildflower – delicate and a little untamed. She was small, the top of her head barely grazing his shoulder, but her brazenness made her mildly intimidating. Though still pulled back, strands of her golden hair fluttered around her face. She turned to him, and he realized her eyes were a rich blue. She flushed at catching him staring. He hastily focused on the drive. Enjoyed the excerpt - have added TIN GOD and SKELETON'S Key to my list. Your book sounds fascinating, Stacy. I grew up in the Mississippi Delta. There aren't many romances set in that particular area. How fun this will be....off to download now! I loved the sound of this book the moment I stumbled across it. TIN GOD and SKELETON'S KEY are both going on my TBR list! I'm sorry I didn't respond to these comments. I forgot to check back after a couple of days. Thanks so much, everyone. I hope you enjoy the books. And Kay, that is really cool! You will have to let me know what you think.